Home » 2013 » April » 11 » Don’t just listen. Read my lips too. 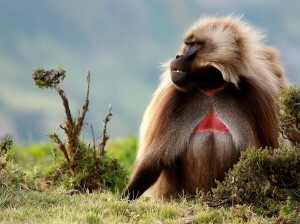 A male gelada, found only in mountain meadows of Ethiopia. By now, most would have already accepted that we are evolved from primates. Well, at least on paper. Have you ever wondered how something as elaborate and complex as human speech could have evolved? Bergman (2013) may just have the answer for you. 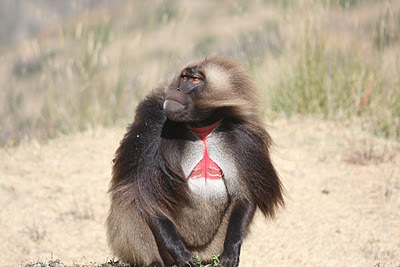 He published an article on 8th April describing the similarity human speech shares with that of the vocal sounds produced by a wild primate,the gelada (Theropithecus gelada). The gelada only lives in the remote mountains of Ethiopia and it produces the vocalization through lip-smacking involving the rapid opening and closing of the mouth and lips. This is called a ‘wobble”. The rhythm of a “wobble” produced by a gelada is surprisingly similar to that human speech. A “wobble” is typically 6-9Hz which closely matches to that of a human’s 3- 8Hz rhythm. Lip-smacking is not a new term. In fact, lip-smacking is a facial expression observed in many Old World primates. Last year, Ghanzafar and colleagues (2012) used X-ray to compare the vocal tract movements of macaques lip-smacking vs human speech. They too found out many similarities between lip-smacking and human speech, leading them to believe that human speech evolution may have orginated from ancestral rhythmic facial expression (lip-smacking). The action of lip-smacking itself is non-vocal, so it was a mystery then in 2012 as to why a non-vocal aspect would have so much similarity with speech. In 2013, Bergman’s discovery of the gelada producing vocalizations by lip-smacking gives support to the hypothesis that lip-smacking may be a plausible evolutionary step towards human speech. Here’s something interesting, while Bergman was doing fieldwork in 2006, he finds himself “frequently looking over my shoulder to see who was talking to me, but it was just the geladas”. Are you eager to hear how the geladas sound like? CLICK HERE!